The Federal Communication Commission's National Broadband Map is a highly useful tool to understand the current availability of high speed internet throughout the United States. This map and its related source data is made available as part of an FCC public outreach program promoting high speed internet availability. Providers Available in a Given Area. Broadband Availability in Relation to Demographics. Blue areas have a maximum available speed of 10 Mbps or less. Red areas have ZERO high speed providers. Upon casual examination, it appears to be the case that areas with high population density are served by one or two high speed internet providers. For most people, the local cable company is the only provider available, and in many populated areas that cable company is Comcast. No matter the provider, available speeds are dreadfully slow. A large portion of those with high speed access can obtain no more than 10 Mbps downlink. Note that speed is the maximum advertised speed, meaning that actual speeds may be (and usually are) much lower. Rural residents have things even worse. The vast majority of land area in the US has no high speed internet available. Residents in these areas are effectively cut off from the benefits of internet access. I have family in rural areas of California that are stuck with dial up internet or expensive and still slow satellite connections. My takeaway is that we need faster connections available to more of the country. Both quality and quantity has to be built out. It's time for another Interstate-style public works project where we lay dark fiber from coast to coast and contract with private firms to light it up. Symmetrical Gigabit speeds are a reasonable goal to start with. Let's get to it! Throughout history, human kind has sought to perfect skills with repeated practice. 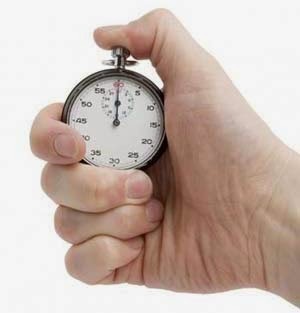 All of us have at one time or another completed a challenging task and wondered "did I do better this time?". Athletes training on a team benefit from the real time feedback of their coach or team mates, meaning focus remains on good form and proper pacing without staring at a clock. For those of use who do not train with a coach or trainer, the question than becomes "how do I know how I am doing?" In the good old days, a mechanical stop watch dangling around one's neck was state of the art in terms of self-evaluation, assuming that one took the time to stop and read the watch. Thankfully, today we have something so much better! Meet Strava, a social training platform that provides personalized, real time feedback and metrics during runs and rides. The premise is simple - capture GPS data of a run or bike ride and analyze that data to answer the question "how did I do?". In fact, I have been trying to do this for years using my cumbersome GPS unit. I'd collect the data, import a GPX onto my computer, view and edit, generate speed and elevation profiles, and ultimately attempt to publish my data. Unfortunately, this process was entirely too time consuming to do regularly, meaning my data piled up in a messy virtual junk heap. Thankfully, Strava's smartphone app and web platform provide a powerful training analytics platform where difficult data capture and manipulation processes have been elegantly automated. I signed up for a free Strava account, downloaded the application onto my android phone, and set off for a ride on my trusty Univega. I was quickly impressed by how intuitive the application was to use, and how little battery power it consumed (a big issue for GPS-dependent apps). When I finished my ride, I was delighted to see my phone displaying a map of my route along with some basic stats: avg MPH, elevation chance, and distance. My route was automatically uploaded to Strava's cloud service where I can view more detail. Additionally, the application breaks a route into segments based on segments created by other Strava users, allowing users to compete against each other on the same segment, with the fastest riders listed on that segment's leader board. Additionally, I can track my progress per segment, meaning that a huge hill doesn't bring down my avg MPH for the whole ride. My recently ride was automatically broken into segments by Strava. As a casual athlete, I find this app incredible exciting. It's super easy to use, and provides analytics which are useful for both casual runners and riders as well as serious athletes. Additionally, it's fun to know how you rank against other users. Because I know others can see my performance, Strava gives me the distinct feeling that every run and every ride count. There is no time to be lazy and take it easy, because now we have a virtual crowd-sourced team to encourage us during that last mile when things seem the toughest. Thanks to Strava, my workout routine is new and exciting again, and I can't wait for my next ride. My (as of yet very limited) activity overview. Cool! 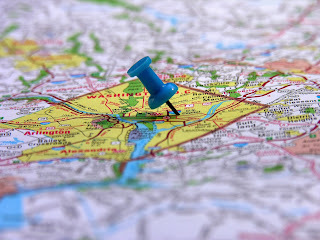 Online Maps, such as those offered by Google, have become the cornerstone of wayfinding in today's always-connected world. I use Google Maps regularly to plan a route, find the right subway stop, or even just check traffic. Until recently, navigation has focused on outdoor navigation only, meaning that a Google Maps user will have no trouble finding the desired building, but then must find their own way once inside. Google is working to change that with a new indoor mapping product. 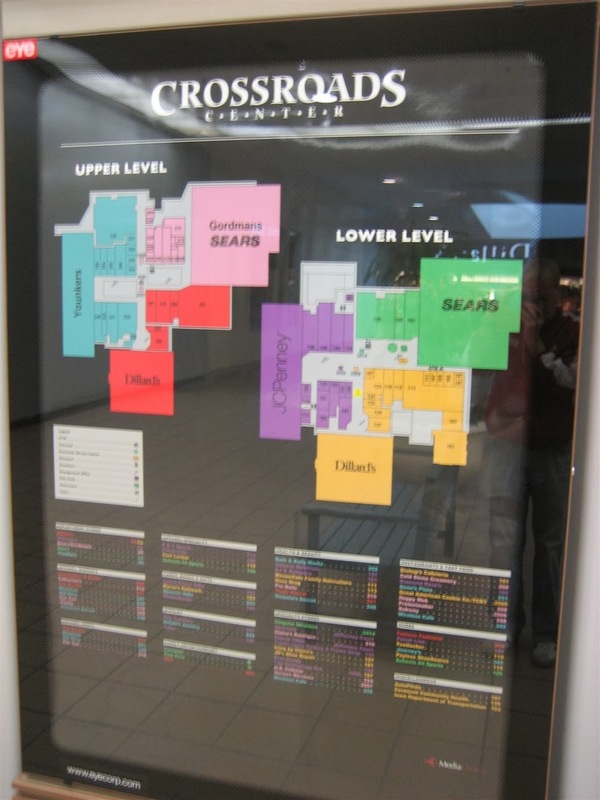 Classic (confusing) map of a mall. If I am in the green, how do I get to the red? between the red and purple stores? Google Maps Indoor has recently starting mapping public indoor spaces and incorporating these maps into the Google Maps application on Android. A user can view inside an eligible building simply by zooming in on the map. The maps can be quite detailed, showing hallways, rooms, bathrooms, elevators and stairwells on each floor of a building. 1) The maps must be made. Outdoor streets and spaces have been mapped and remapped over the years by a variety of organizations, resulting in a comprehensive, up-to-date mapset. Interior maps, on the other hand, exist for few buildings. 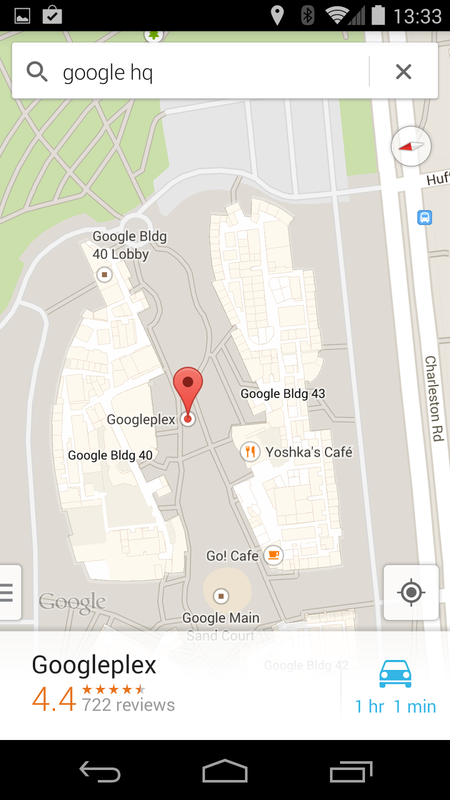 Building owners must upload floorplans for their buildings in order to be included in google maps indoor. For a helpful video on how to do this, click here. 2) Lack of Indoor Location. Most mobile devices are not yet able to determine their location inside a building, meaning that the device can display an interior map of a given building, but cannot indicate where that device is on the map. NFC has provided limited solutions allowing a device to be tapped to an NFC terminal to indicate that "I am here" but this method is quite primitive and usually requires the user to actually touch their phone to a reader. 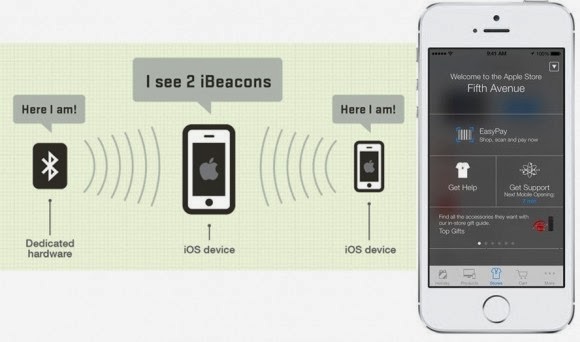 Apple's iBeacon shows promise as a means to determine indoor location, but iBeacon roll-out has not yet reached critical mass of adoption. 3) No Indoor Routing Instructions. The ultimate goal with indoor mapping is enable turn-by-turn navigation inside buildings. The ability to view indoor map data is a start towards this end, but a device must also be able to determine it's indoor location to accurately navigate. In addition, each building must be associated with a routing table, which helps the map software understand how different pathways interconnect throughout the building. Without a routing table, the mapping application has no idea if Hallway A connects to Hallway B, or if the door in Hallway B opens one way or both, etc. of the interior of the GooglePlex. Google Maps Indoor by Thomas Vieira is licensed under a Creative Commons Attribution-ShareAlike 4.0 International License. 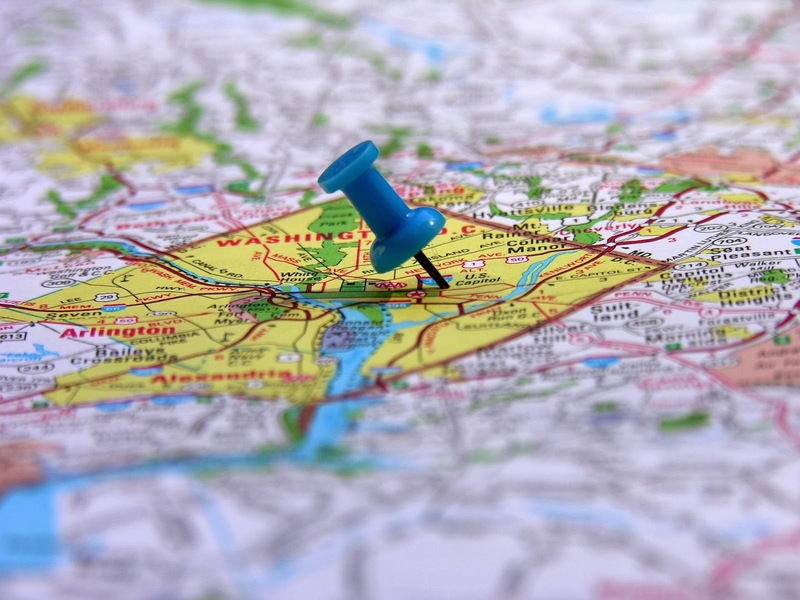 Twitter is reportedly experimenting with a new feature which will show nearby tweets on a map. This feature, currently referred to as "Nearby," appears designed to encourage users to geo-tag their tweets by providing the user value in sharing their location information. Currently, users may geo-tag a tweet, but this feature is not enabled by default. Twitter is attempted to make money by selling advertising, and having more location info about more users will make Twitter's advertising inventory more value. 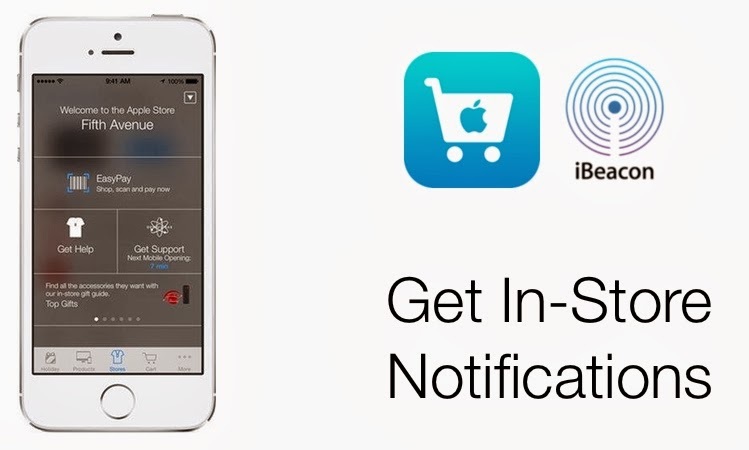 Users get the benefit of being able to see what is going on around them. This may be immensely useful for finding out about current news and further cements Twitter's position as the go-to source for news happening right now. Imagine seeing a plume of smoke rising from ten blocks away - the first thing most of us tweeters would do is search Twitter for likely keywords, i.e. "smoke SF Financial district." Even the most artfully crafted searches still leave the user sorting through a huge amount of content. Twitter's new "nearby" feature will allow users to see tweets based on their geo-tagged location, making it much easier to see tweets being sent from the area of interest. Note that geo-location enabled tweets have been possible for some time now. Several years ago, I worked with a developer who was making a "heat map" of tweets containing a given keyword. 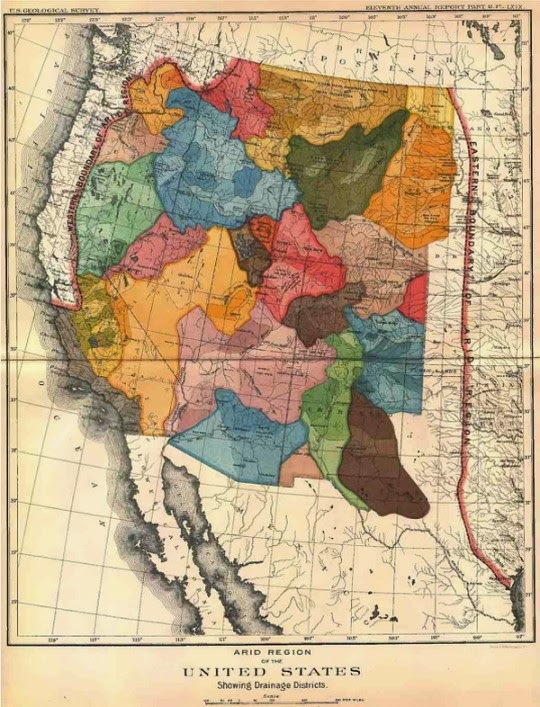 Higher tweet densities were represented with brighter colors on the map. I do not know the technical solution this developer had implemented, but so far as I can tell, Twitter's new API does not add new functionality, but rather, makes existing functionality available to users posting from 3rd party clients. We received our first winter storm recently here in the San Francisco Bay. A cold low pressure system moved in from Alaska and brought with it freezing temps, driving winds, and several inches of rain. I found this inclement weather to be a welcomed break from the typical winter pattern cool, calm, hazy days. The worse of the rain moved past after a few days but left behind strong winds. I couldn't help but take advantage of this break from typical winter calm to go for a sail. After grabbing some sandwiches and bundling up against the cold, I headed out of Loch Lomond Marina in San Rafael and set a source south to Angel Island. Taking advantage of the unusual wind out of the north west, we had a leisurely cruise under the Richmond San Rafael Bridge and down towards the bustle of one of the world's most iconic waterways. Our route on the San Francisco Bay. 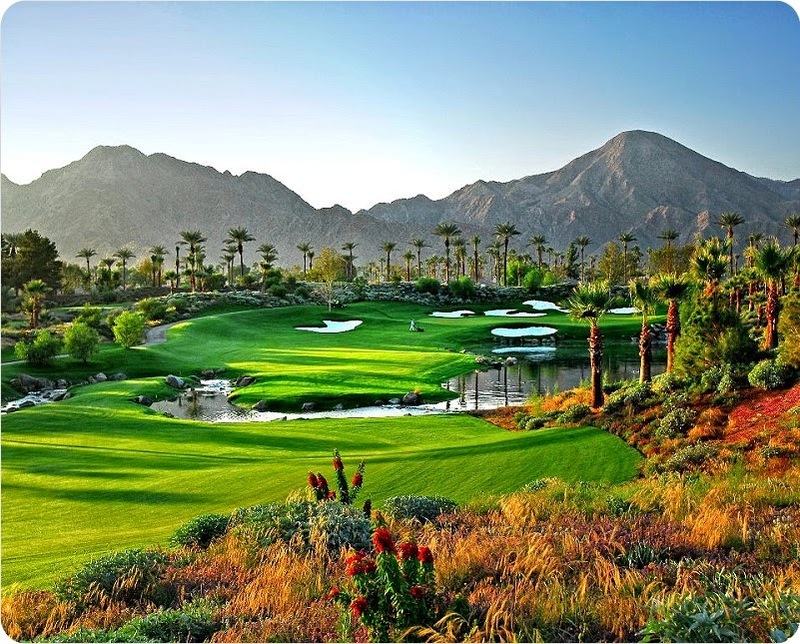 make the turn WIDE to stay in deep water! Loch Lomond Marina is difficult for sailboats. The marina sits about one mile from the deep water channel on the edge of a tidal mud flat. The water depth leading up to the marina is about two feet, which is tricky because the sailboat I use requires five feet of depth to pass safety. Fortunately, there is a channel dredged across the mud flat which is deep enough to navigate in a sailboat. 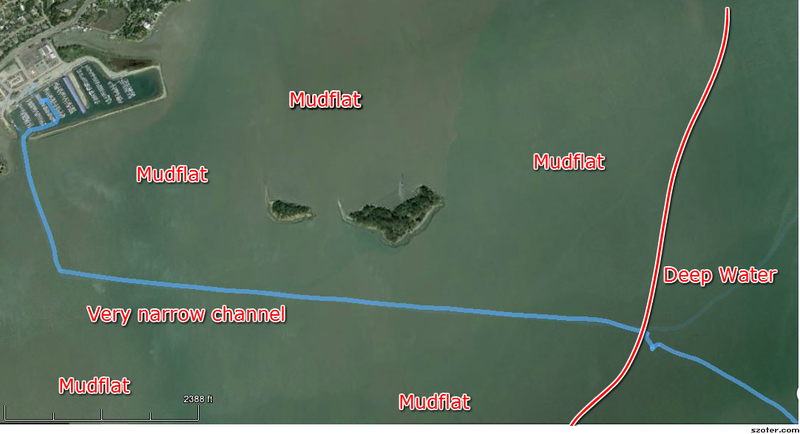 Unfortunately, this channel is poorly marked and very narrow, and the only sure way to know you're not in the channel is once your vessel becomes mired in mud. As you can see in the above picture, there is a small channel out of the marina which feeds into a slightly larger channel at a ninety degree angle (the blue line is the path taken by my vessel through these channels). Both channels are marked poorly, and the areas immediately surrounding this turn are especially shallow. Too wide of a turn will run one aground, as will too narrow of a turn. I have "played in the mud" here on several occasions, and have learned to not even attempt entry at low tide. 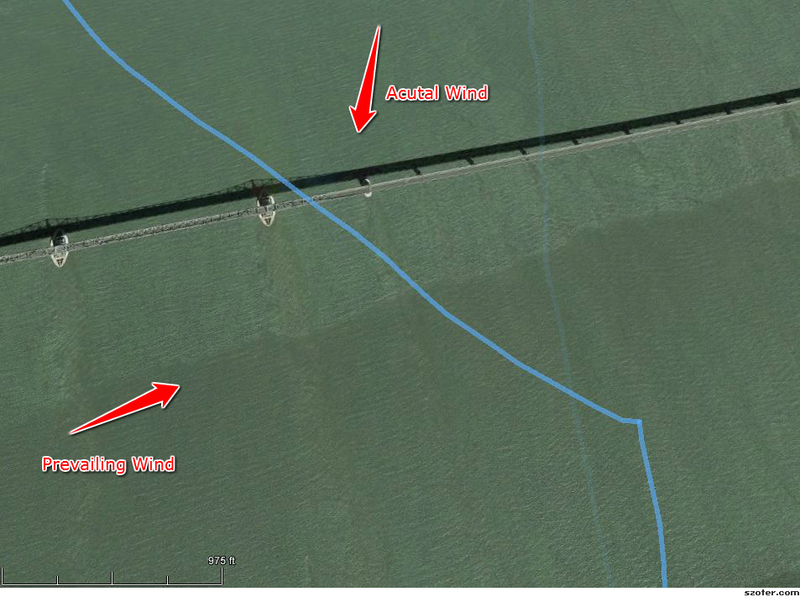 Successful transit of the San Rafael Bridge under sail power was possible because of the storm's unusual winds out of the north and west. 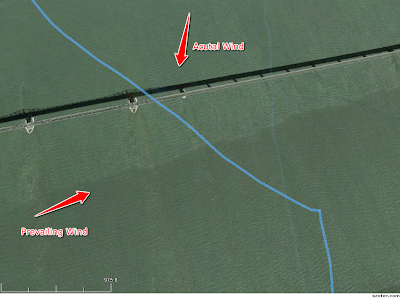 The prevailing wind, out of the south and west, is readily blocked by the bridge, making it difficult to safely cross without starting the motor. The wind out of the north, however, was able to keep the sails full all the way under the bridge - a rare treat! Squeezed between Angel Island and passing some container ships. Rounding Angel Island brought us head to head with a line of oncoming container ships. Luckily I was able to hug the coast and stay out of their way (and their wakes). The fun upwind portion of the sail. After rounding the southern tip of Angel Island and taking in some great views of San Francisco, we headed back upwind. Sailing against the wind is much rougher and more difficult than sailing with the wind. A sailboat cannot move directly into the wind, so we had to tact back and forth across the wind many times to get back upwind to where we started. Going upwind is a lot more work than going downwind. Check out our recorded speed (the blue line). We averaged 4.4 mph, which is not bad for the entry-level 27 foot sailboat we were sailing. During some of the heavier gusts, we hit close to 8 mph! Complete route map - zoomable and scrollable!